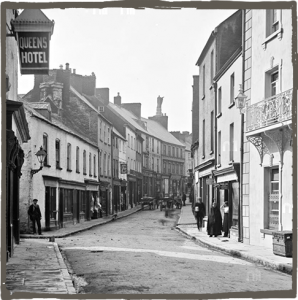 The story of how a scold or nagging woman was punished by being strapped to a stool and ducked in the waters of the River Fergus is just one of the fascinating tales brought to life on our guided walking tours of the medieval town of Ennis. History, mythology, legends, ghosts, poverty, murders and more are all explored on this tour which runs every day except Wednesday and Sunday at 11:00am from May until Oct meeting outside the Ennis Tourist Office. Experience a journey through time as we explore the medieval architecture and winding lanes and “bow-ways” of the town while revealing the characters and stories that have shaped its past. Rich historical sources are used to illuminate the lives and experiences of the ordinary poor of Ennis as well as the rich and powerful leaders that shaped our destiny. This acclaimed tour provides a highly entertaining and thought-provoking experience of the charming town of Ennis. Tours runs every day except Wednesday and Sunday at 11:00am and lasts approximately 75 minutes. We walk approx. one mile at a moderate walking pace, stopping at various points along the tour. We meet outside the Ennis Tourist Office which is just off the main square in the centre of the town. Arthurs Row laneway, beside the O’Connell monument in the main square, leads to a courtyard which is shared by the Ennis Tourist Office, the Clare Museum and the Temple Gate Hotel. The tour meets in this courtyard beside a sign for Ennis Walking Tours. The tour consists of approx. 10 stops and will take in all the major sights of the town of Ennis including the O’Connell Monument, the old bow-ways, Old Abbey, 1916 memorial, Franciscan Friary, McParland Building, Chapel Lane church, the Market, St Peter and Pauls Cathedral and much of the towns art and sculpture trail. Ennis Walking Tours happily accepts walk up participants. However, you may prefer to pay in advance to secure a place. Please click here to go to our booking page. Tours run every day, except Wednesdays and Sundays, from May into October.